So I was excited to see this recipe for broccoli beef stir fry from the American Heart Association. 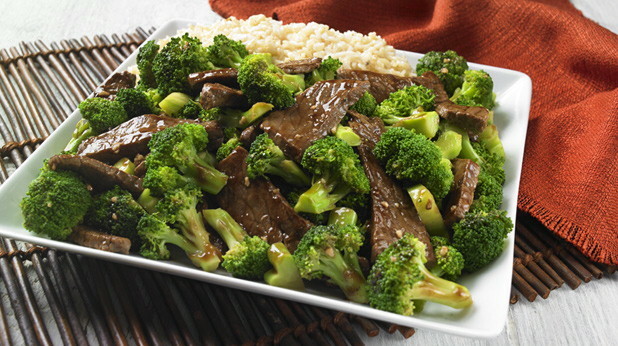 It uses only a tiny amount fo low-sodium sauce sauce, one tablespoon, for a pound of beef and two pounds of broccoli. I might add some Mrs. Dash salt-free teriyaki marinade to intensify the Chinese flavors a bit. I would also eat two servings here, each serving being four ounces of beef. That doubles the fat content to 16 grams and the sodium to 488 mgs, still ok under my daily targets of 40 grams of fat and 1,200 mgs of sodium. Using white meat chicken, which is lower in fat, would cut the fat even further. I also have some chicken stocks that have even less sodium than varieties labeled low-salt, so that could help with sodium as well. Another possible substitute for vegans is using tofu instead of meat. If anyone tries this before I do, let me know how it turns out.